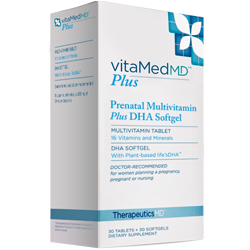 A 30-day supply of the Prenatal combo pack (Reg vitamin + DHA) is only $29.99. The DHA pill is plant-based, not fish or whatever that a lot of pregos have a hard time swallowing (literally). I can't taste a thing, personally. You don't need a written Rx... if your doctor is in their system, you can just look them up when you order. The vitamins are shipped to you FREE and they have auto-refill programs at no extra cost/obligation. I don't have to do anything. My vitamins just show up in my mailbox every month. No awkward conversations with pharmacist. They have awesome customer service. Once or twice they have called me when they were running a special to make sure I got the better deal than what I was automatically signed up for. So there you have it. There are a bunch of other vitamin products on the site I know nothing about. And no, I was not asked to endorse this site or product... I just happen to think it's awesome compared to dropping twice as much money and making monthly pharmacy runs.